The Baron is definitely a meat and potatoes kind of guy... and next to potatoes, he's got to have some bread. Marnee, his mom, makes such wonderful breads and this was something she prepared over the past holidays. It's a breadmaker recipe, making it easy to put together. I really like the presentation of these rolls because they are knotted before baking and come out in such beautiful shapes. You can adapt this by using any other fresh or dry herbs such as rosemary, basil, thyme or a combination. The use of potato flakes lends to a soft and tender texture! Measure all dough ingredients. Place into bread machine in order suggested by manufacturer. Process on dough/manual cycle. Remove prepared dough; if necessary, knead in additional flour to make dough easy to handle. Divide dough into 12 or 18 pieces; roll each piece into a 10 inch rope. Coil rope, tucking under end. Place 2 inches apart on a greased baking sheet(s). Cover and let rise until doubled, about 45 minutes. Brush tops with lightly beaten egg and bake at 375º for 15 to 20 minutes or until done. * This recipe can also be used to make bread. Place ingredients in bread machine and process on bread setting. Oh yum! Fresh dill sounds fantastic! I've never seen a recipe like this (we're not big into bread) but this would be perfect for Easter brunch with guests! Thanks! Gotta love potato rolls! I never thought to add herbs to them - dill was a great idea! I'm a sucker for anything with dill. Making homemade bread is on my bucket list- and now even moreso! Fresh bread makes me weak at the knees! 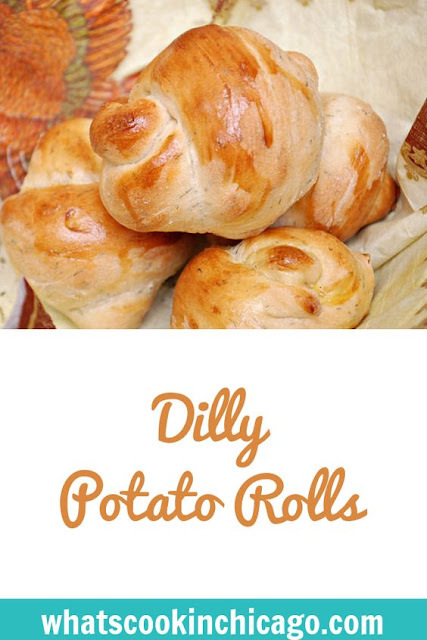 I love homemade rolls... all of 'em, pretty much, but when it comes to potato rolls I'm especially nutty. And the dill? Brilliant! These are so gorgeously golden! 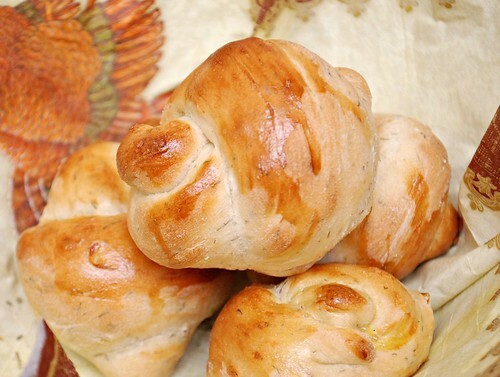 THere's nothing like homemade rolls for a holiday dinner. I absolutely love your ingredients. These sound so soft and fresh! The first line says "Measure all ingredients except egg and toppings"
I am assuming the toppings are the herbs? And if yes, when do you add them (it doesn't say in the instructions...)? Just making sure. I think I might add these ingredients to my shopping list and whip up a batch of these for this weekend. @Cindy - thanks for asking! I clarified a bit and all dough ingredients (which is everything listed in the ingredient list except the lightly beaten egg) are to be combined and placed into the bread machine per manufacturer's directions. I just love potato rolls! They are hard to resist and the addition of herbs takes it over the top. Love that you threw dill into these rolls! Delicious! How perfect would these be for Easter?!?! I love them!